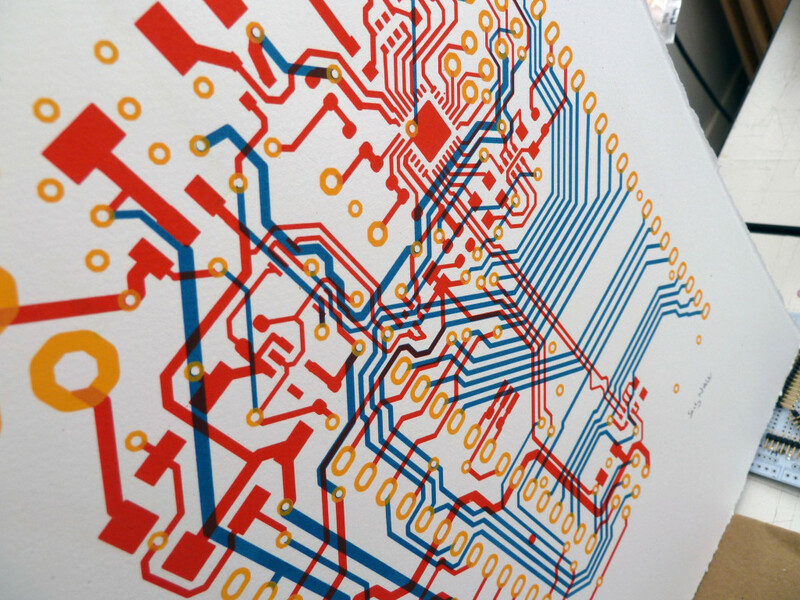 I produced a short edition of screen prints, showing a couple of circuit patterns that had been important to me. The first was my own Polarshield. 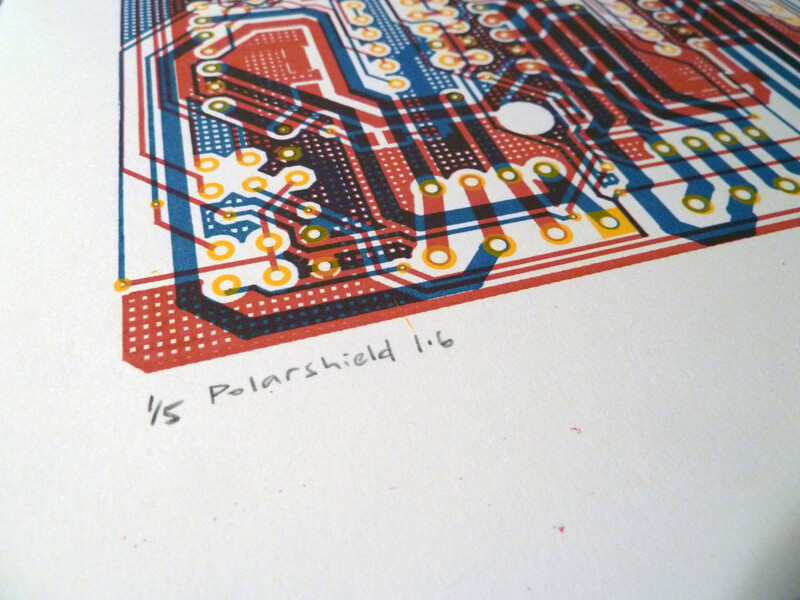 This is important because the Polarshield was the first PCB I ever designed myself. As I laid the traces out, it became obvious that this was not a simple engineering task. There was an element of puzzle-solving and some actual expression in deciding the patterns. Some patterns just looked nice, and it had nothing to do with their technical function. I began to think about the myriad designs that sat inside our electronic devices, and how much care and attention had gone into them, and how they would never be looked at. Yet each corner and angle had been laid down, by hand, by a person like me. As a child, like most of us here, I loved tearing open things and seeing the little cityscapes that lived inside, with their polished towers and glass beads, and that secret arrangement of fibreglass boards and wandering copper traces, like the lines on Nazca plains. They seemed impossibly complex to me at the time. The second was a simple layout of an Arduino UNO R3. This is unusual because the circuitboard itself is actually so well known. Nevertheless, abstracted from it’s familiar blue rectangle, the circuits are hard to recognise. When you know what it is, you can read it. Both editions of these pieces (very small editions) sold out within a matter of weeks. 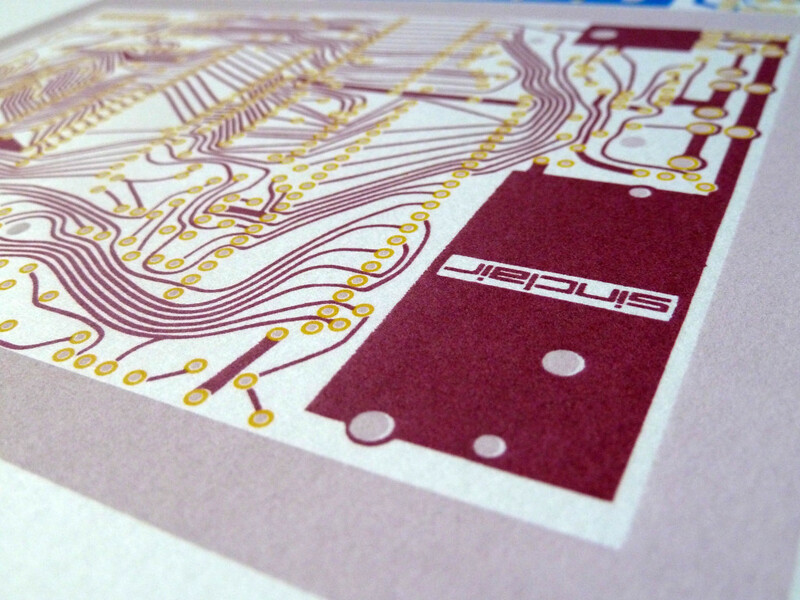 In June 2015, I finally got back into the print workshop, and have started quite an ambitious new set of editions, featuring designs from the computers we grew up with. Sinclair ZX81 was the first computer in our house. So it is the first in the new series of portraits. We never had a ZX Spectrum though. Got the guts of one now. This collection was launched with the Commodore 64 as it’s flagship in December 2015. Please drop me an email (sandy noble at gmail dot com) if you have a suggestion, or would like to discuss this project. 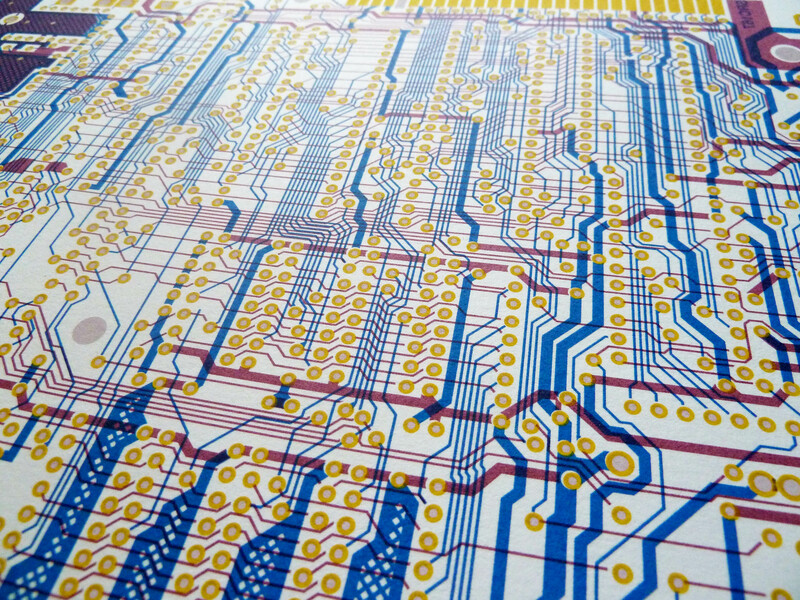 These “Circuit Portraits” are portraits of hardware indeed, but also portraits of their designers, as they expressed themselves with their tools. If you know any of the original designers of these old 70s / 80s boards, I’d love to get in touch and celebrate their creations. Buy at Etsy or from my BigCartel shop. There’s a blog about it too at printjustice.co.uk and lots of pictures in my Circuit Portraits flickr set.